The C&O Canal has a boat ramp at the Monocacy Aqueduct. There are 20 parking spaces and portable restrooms. The ramp is located off Md. Route 28 on Mouth of Monocacy River Road. 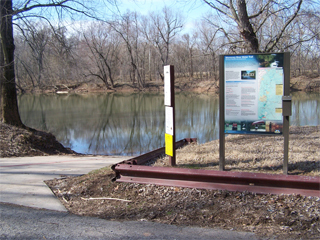 An interpretive marker at the Monocacy Boat Ramp describes the Monocacy Scenic River Water Trail, a 41-mile stretch of the river from the Frederick-Carroll County boundary downstream to the Potomac. The river is usually runnable in the spring and early summer to mid-July, and from late fall through winter, unless there is a drought.